Over centuries of war, elaborate disguises have been used many times to hide a combatant’s true force or intention. This spans from the famous Trojan Horse of the Trojan Wars to the fake spying trees of the First World War. In World War Two, the German Wehrmacht employed such tactics in quite an elaborate fashion. 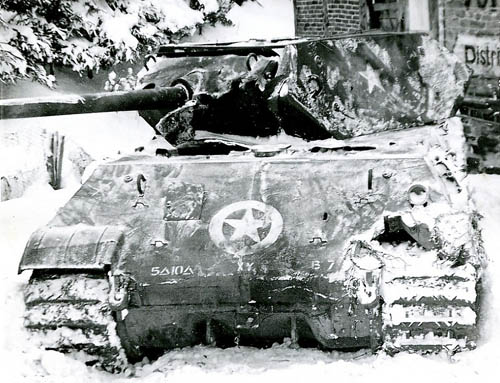 In winter 1944, the Battle of the Bulge was in full swing. As part of a special operation, codenamed Greif, the Germans employed an even more elaborate deception. 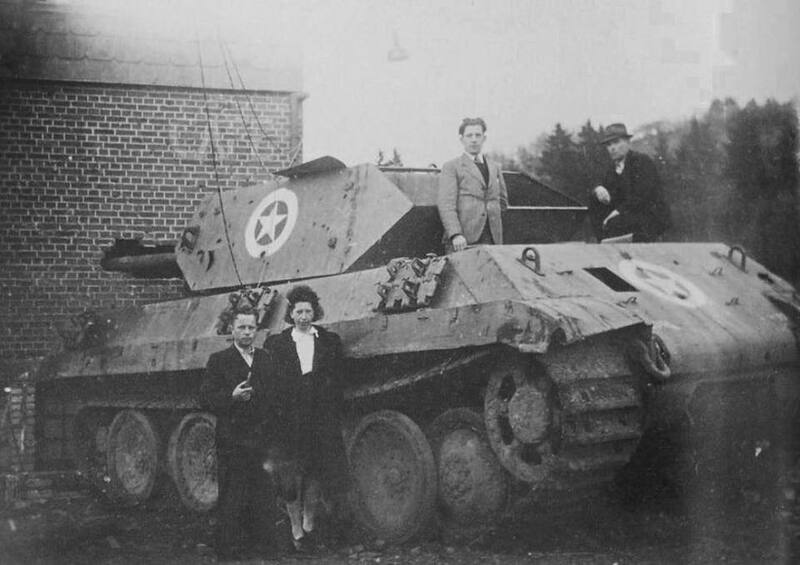 This involved taking multiple Panzerkampfwagen V Panthers and disguising them as the American M10 ‘Wolverine’ Tank Destroyer. To quote the fictional Captain George Mainwaring; “this is just the sort of shabby trick the Nazis would play”. The brainchild of Adolf Hitler and commanded by Waffen-SS Commando Otto Skorzeny, Operation Greif (meaning Griffin) was part of an elaborate special operation during the Battle of the Bulge in the winter of 1944. Skorzeny had become one of Hitler’s most trusted operatives, especially after he succeeded in the rescue of Benito Mussolini in the autumn of 1943. Skorzeny was ordered to form Panzer Brigade 150 whose role would be to capture as many bridges over the Meuse river as possible. The twist to the operation was that the troops in the Brigade would be disguised as British and American troops and also use the enemy’s equipment, vehicles, and tanks. The hope was that it would lead to catastrophic confusion. The SS Commando was concerned, however. With his men in disguise, they were in breach of the Hague Convention of 1907 (Part IV, Section II, Chapter II). This meant, that if any of his troops were to be captured in the uniforms of British or American soldiers, they could be shot as spies. With the Ardennes Offensive looming on the horizon, Skorzeny only had a matter of weeks to assemble his brigade. 3,300 troops were requested in total to fill three battalions. Part of the request was that the troops have general knowledge of the English language or American dialects. The Western German Army Command (OB West) was charged with finding the needed US and British equipment. This included 15 tanks, 20 self-propelled guns, 20 armored cars, 100 jeeps, 40 motorcycles and 120 trucks. They were also tasked with collecting as many British and American Uniforms as possible. Once gathered, the equipment would be sent to the Brigade’s training ground which was set up in eastern Bavaria at Grafenwöhr. What was delivered to the training ground fell far short of Skorzeny’s requests. Of the 3,300 men requested, only around 400 spoke any kind of English. The best English speakers, 150 of them, were formed into a commando unit known as Einheit Stielau. To fill the gaps in the infantry, Skorzeny recruited from other corps such as the SS-Jagdverbände, SS-Fallschirmjäger, Paratroopers and tank crews from other Panzer Regiments and Brigades. This still did not meet the desired 3,300 men, 2,500 would be all Skorzeny had to deploy. The Brigade was scaled back to two battalions to cope with the smaller than anticipated number of infantry. Infantry numbers were not the only disappointment. Far fewer captured Allied vehicles were available than anticipated. Just 49 unarmored vehicles were delivered. The shortfall was met with German Army vehicles repainted in the American Olive-Drab. 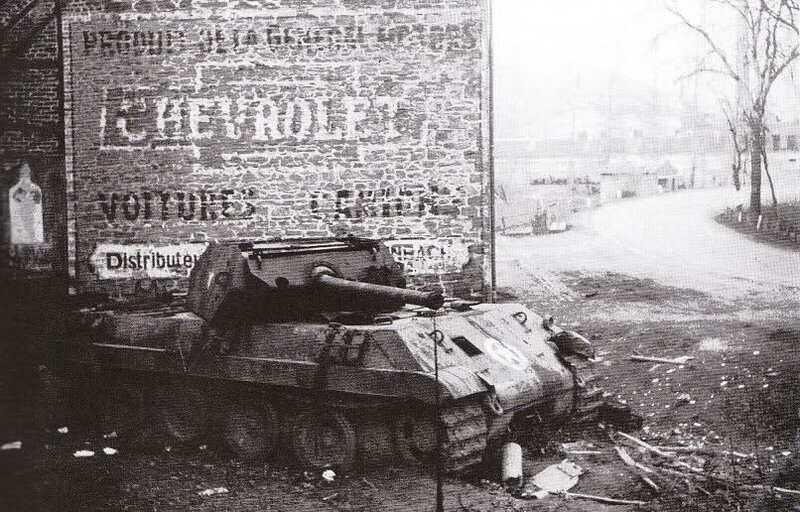 What was worse, however, was that of the 15 requested captured Allied tanks or ‘Beutepanzers,’ only two American M4 Shermans in an ill state of repair were delivered. To cover the gap left by these decrepit M4s, Skorzeny employed five of Germany’s own tanks, the Panzer V Panther. But, to blend in with the operation, modifications had to be made. Defined as a medium tank, the Panzerkampfwagen V Panther entered service in 1943 in response to the Soviet T-34. It had armor of up to 80mm, with the upper glacis sloped at 35 degrees. The tank was powered by a Maybach HL230 P30 V-12 rated at 690 hp, producing a top speed of up to 34 mph (55 km/h). The Panther was armed with the 7.5 cm (75mm) KwK 42 L/70 which could penetrate up to 199mm of armor at 1000 yards. It also had a bow and coaxially mounted MG 34 7.92mm Machine Guns. It was operated by a five-man crew; Commander, Gunner, Loader, Driver, Bow Gunner/Radio-Operator. The particular Panthers chosen for Operation Greif were Ausfuhrung Gs. The Ausf. G was produced from March 1944. It was the last model of Panther to be produced in large numbers and featured a number of changes over the previous models that were originally intended for introduction on the canceled Panther II. This included thicker side armor, the addition of a wedge on the bottom of the mantlet to eliminate the shot trap, and the deletion of the driver’s vision port in exchange for a rotating periscope above his position. For the Panthers to assume the appearance of the Allies’ M10 Tank Destroyer, a number of cosmetic changes had to be made. The description of the changes is based on information from the issue 57 of the U.S. War Department publication Tactical and Technical Trends, published in April 1945. As it is a wartime intelligence publication, some data may be missing or may be inaccurate. The turret saw the heaviest application of this ‘camoflage’. To replicate the M10’s unique turret shape, five sections of sheet metal around 3.4 mm thick were cut. Two pieces were cut to mirror the turret sides. These were flanged and bent into shape, supported by iron bars. Two more pieces were placed on the rear of the turret to represent the lower bustle and counterweight and were strengthened with iron bars. This counter weight piece is mysterious, as there appears to be no visual record of it. These four pieces were then attached together, and the frame work welded to the turret. Even the smallest M10 turret details were closely studied and replicated, including the lifting eyes, brackets and the attachment points for appliqué armor. A false gun shield was manufactured and welded to the Panther’s own. A hole was made for the coaxial machine gun, something the original M10 did not require as it did not have one. The most drastic change to the turret came with the removal of the iconic German Commander’s cupola. Having been cut out, it was replaced by a simple two-piece hatch. Each piece was hinged for opening. No vision devices were added, so the commander was now effectively blind when buttoned down. Bow: The hull saw the heaviest application of fabricated M10 parts. Roughly four pieces of sheet metal, all 3.5mm thick, were carefully formed and welded into place to replicate the iconic bulbous transmission housing on the bow of M4 derived tanks. A further sheet of metal was welded over the upper glacis. A trap door attached to a chain was cut into the piece to allow use of the bow MG 34 Machine Gun. As with the turret, the appropriate towing eyes and brackets were applied to these pieces. 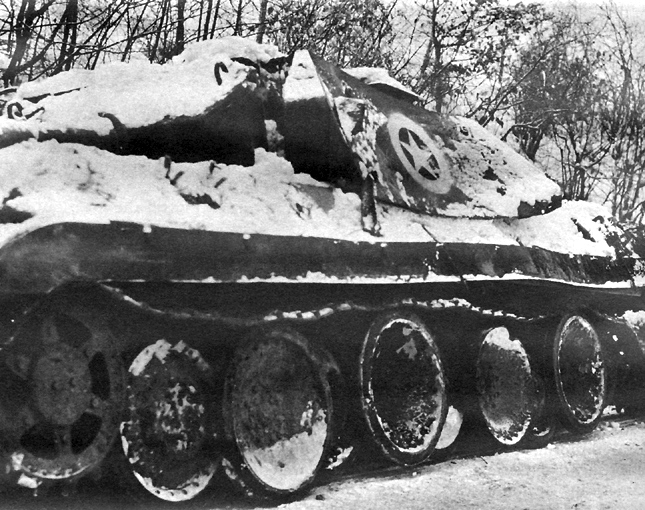 Sides: In an attempt to replicate the sloping side armor of the M10 which overlaps the return of the track, a long piece of sheet metal was cut and welded horizontally along the flanks, replacing the Schurzen side armor. Three blocks of spare track links were also added along the sides replicating the stowage pattern used on the M10. 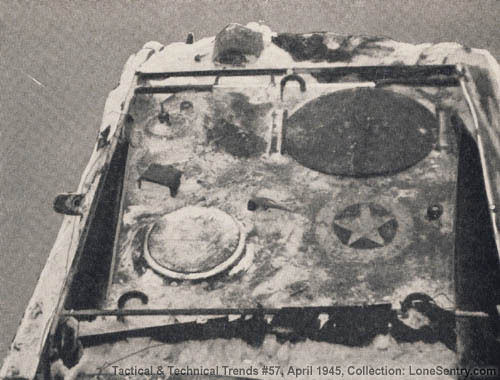 All external stowage such as the pioneer tools, ramming staff water cans and jacks were removed. Rear: The rear of the Panther saw the addition of a false rear. A box like frame was welded together from 4-5 pieces of sheet metal and welded to the rear of the tank. This was attached in place of the two large stowage boxes to replicate the overhanging tail of the M10. Holes were cut in the seam along the top for the exhaust pipes. On the top of this box, a replica of the M10s fixed gun rest was also welded into place. Paint: Paintwork was the final step in the disguise. The entire tank was painted in a reproduction of the typical American Olive Drab paint. Allied star markings were applied to the upper glacis and also to the sides and roof of the turret. False unit markings were also applied to the bow and rear. There were parts of the Panther that were too hard to disguise too. The biggest issue, of course, being the classic German overlapping road wheels which looked nothing like the VVSS (Vertical Volute Spring Suspension) of the M10. The tracks were also much thicker. Another was the muzzle brake of the L/70 which had to be retained for the gun to operate safely and effectively. Apart from the British 17-Pdr Achilles variant, the M10 did not have a muzzle brake. The overall size of the Panther was an issue too, as it was wider, longer and taller than the M10. 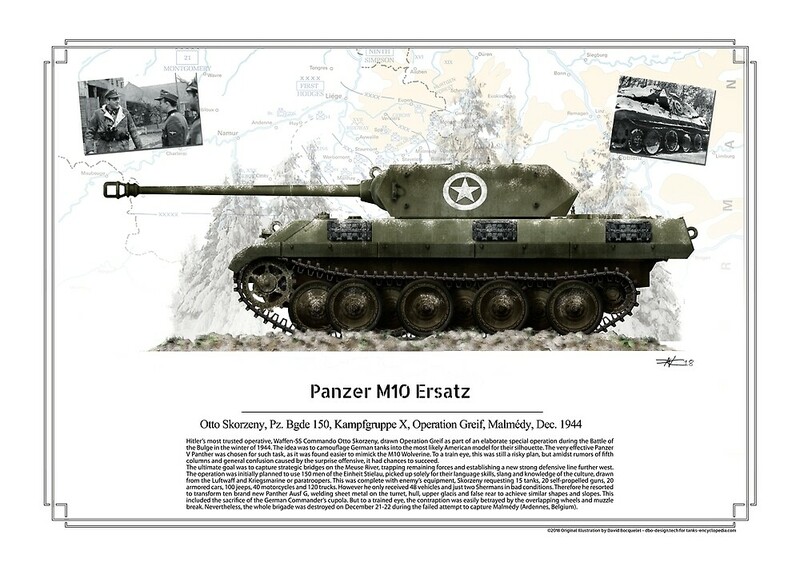 Buy this poster and support Tank Encyclopedia! A standard allied M10 “Wolverine” for comparison. This is the appearance that the 150 were aiming for. Standard Panther Ausf. G for comparison. With this, you can see the how extensive the modifications were. All illustrations are by Tank Encyclopedia’s own David Bocquelet. In action, the disguised Panthers used a number of methods to signify to surrounding German forces that it was indeed a friendly vehicle. This included painting a subtle yellow triangle on the rear of the tank. Another method was that all the disguised tanks would have their guns aligned in certain direction. Before the operation started, rumours began to spread among the troops about the Brigade’s purpose. The troops believed they would be reinforcing besieged towns such as Dunkirk, Lorient, another was that they were to capture Antwerp. The most elaborate speculation was that their orders were to capture the Allied Supreme Command at the Supreme Headquarters Allied Forces Europe (SHAFE) in Paris. Not even Skorzeny’s own commanders knew about the true plan. Just 4 days before the beginning of the operation on the 10th of December, would they know. On the 14th of December, the 150th Brigade was assembled near the historic town of Bad Münstereifel moving out on the 16th. The aim was to capture two or more bridges over the River Meuse at Amay, Huy and Andenne. The brigade was supported by three Panzer divisions; 1st SS Panzer Division, 12th SS Panzer Division, 12th Volksgrenadier Division. The bridges were divided between the three battle-groups that would each hold a bridge until they could be destroyed, which would prevent the Allies from crossing. It was hoped that the confusion caused by the Allies receiving fire from what appeared to be friendly vehicles and troops would play into the hands of the Wehrmacht, and in turn increasing the likelihood of success. However, the brigade became delayed by two days after the 1st SS Panzer Division failed to link up at the starting point. With this 48 hour delay, Skorzeny realized that the original plan was now doomed. As a result of this failure, Skorzeny attended a meeting at the 6th Panzer Army’s Headquarters where he suggested that his brigade take on the role of a normal army panzer unit. This was approved, and the Commander was ordered to assemble his forces south of the Belgian municipality of Malmedy. Under Skorzeny’s command, the Brigade moved out on the 21st of December 1944 in an attempt to take Malmedy. The 150th tried several times to take the town, but they were repelled by the defending American forces, including the 120th Infantry Division, every time with heavy artillery support. Private Francis Currey of the 120th received the Congressional Medal of Honor after he managed to knock one of the tanks out with a Bazooka. The artillery pummeled the 150th into submission, taking a heavy toll on the brigade. Even Skorzeny himself was wounded by shrapnel. Skorzeny’s unit would be the German’s only attempt to take Malmedy during the Battle of the Bulge. Operation Greif succeeded in causing a great deal of confusion in American and Allied forces. Spies were thought to be everywhere. It was even thought at one point that there may be an attempt to kidnap General Eisenhower. This paranoia spawned from a German commando team which was captured on the 17th of December where one of the commandos told their captors that there was a plan to capture the general. A number of friendly-fire incidents also occurred as a result of the confusion. On the 20th of December, two American GIs were shot at a checkpoint by a military policeman in a case of mistaken identity. Such incidents continued to happen into early 1945, when two more were killed and several injured when the US 6th Armored Division engaged the 35th Infantry Division by mistake near Bastogne. 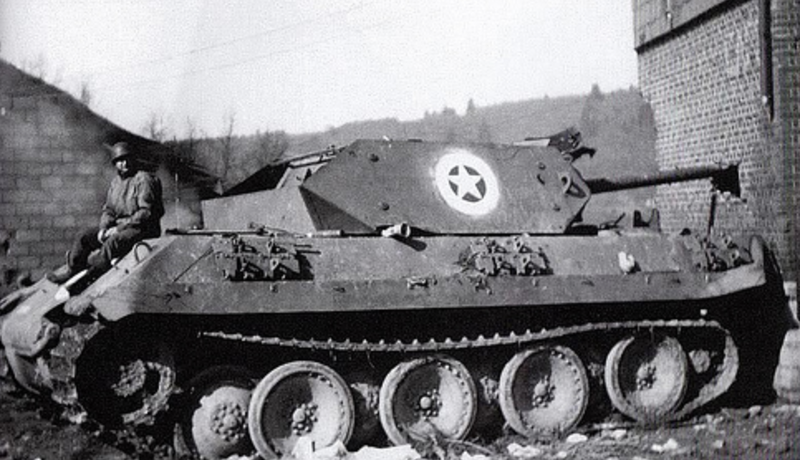 In total, four of the Ersatz M10s were knocked out during the battle. After the action, the Ordnance Intelligence department investigated the hulks of these Trojan Horses. From numbers found on the tanks, it was thought that there were at least ten converted vehicles. The destroyed vehicles they studied had the identifying numbers of B-4, B-5, B-7, and B-10. In the more intact wrecks, investigators found American uniforms including overcoats, helmets, and trousers. The investigators surmised that had the tanks been deployed with a bit more care and cover, they would’ve been extremely effective and dealt considerable damage. Not much is known about the tanks from this point on. After the investigation, they were likely scrapped. None of the Ersatz M10s survive today. For our U.K. readers, this article can also be found in the August 2018 issue of ‘Classic Military Vehicle‘ Magazine. Panzer Tracts No.5-3, Panzerkampfwagen “Panther” Ausfuehrung G, Thomas L. Jentz & Hilary L. Doyle. It was only the later model Ausf. Gs that had the chin. F*****g love the Ersatz M10. Now in War Thunder. I love this tank and the story it has behind !